MasterPieces: PLANET OF FIRE | Warped Factor - Words in the Key of Geek. Tony Fyler blasphemes against Logar. Yes, technically, we made this list up, but it’s entirely possible something similar was pinned to the commissioning document for Planet of Fire writer Peter Grimwade. There was a lot to get covered in the story – two companions out, one in, plus the Master, plus location shooting. The idea of a story that could tie all that together brought out an urge that has recurred for at least four of the five decades of the show’s history. Since the 1970s, Doctor Who has frequently played out the question of science vs religion. From The Daemons in Jon Pertwee’s era, through The Masque of Mandragora and The Face of Evil in Tom Baker’s, and on to Ghost Light and Battlefield in the time of Sylvester McCoy, The Impossible Planet/The Satan Pit in the time of David Tennant and The God Complex in the Matt Smith Era, the Doctor, while having plenty of faith in people and what they can achieve through positive emotional and intellectual connections, has never been one to blindly accept the notion of deities. 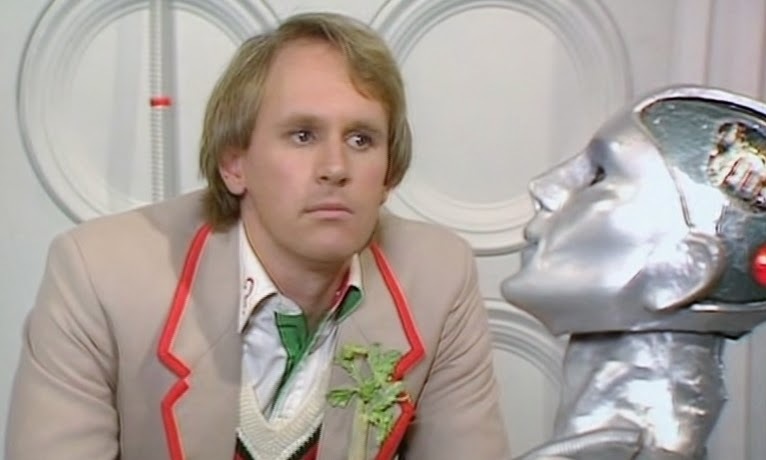 The Peter Davison entry into the battleground between faith and science though is one of the more distinctly-stated positions. Distinct largely because the believers in Planet of Fire are ruled by the High Priest Timanov (played with the magisterial humility of a grand vizier by Peter Wyngarde), who is no harmless advocate of peace, love and charity, but is quite prepared, and even honoured, to cast unbelievers ‘into the flames’ of his home planet, Sarn, because he honestly, explicitly believes they must lead ‘such unhappy lives’ in their faithlessness. So – no grey, agnostic areas there then. The story opens with two agnostics actually climbing the Mountain of Fire which is sacred to Logar (the god worshipped by Timanov’s flock), and becoming the Hitchens and Dawkins of Sarn when they discover precisely nothing there. But the smoke from the mountain is being interpreted as a signal that the ‘time of fire’ is at hand. There’s vocal opposition to Timanov’s assertion that the people must do nothing when the river of fire (molten lava to you and me) erupts from the planet and floods the inhabited areas. And so, essentially, the faith versus science underpinnings of Planet of Fire are set in place. Malkon, ruler of Sarn by virtue of a ‘birthmark’ of two triangles on his arm, is uncertain which way his heart pulls him, though Timanov is on hand to guide him closely. Essentially, the destiny of the people of Sarn is Malkon’s to decide, and the debate over faith versus science takes place in his mind and his subsequent actions. Meanwhile, Earth archaeologist Howard Foster has dredged up some statues buried at sea – and a peculiar metal object, imprinted with two triangles on it. And in the Tardis, Kamelion has gone a bit doolally having plugged himself into the Tardis computer. 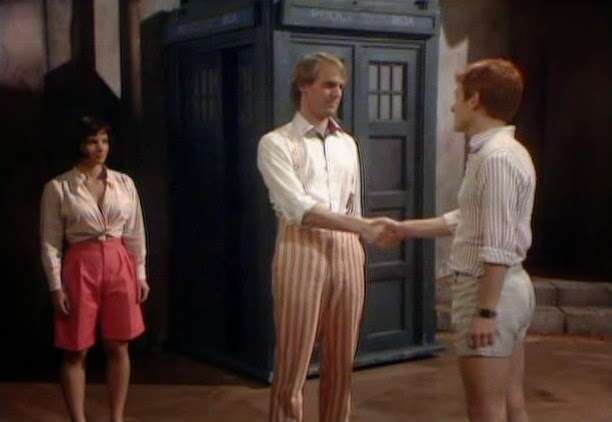 Turlough discovers he’s receiving a signal from Trion… wherever that is. Howard’s step-daughter, Peri, steals the metal thingummyjig when he strands her on a boat, and Turlough rescues her from drowning. Kamelion tries to take the Tardis to what he calls ‘the point of contact’. Spotting the double-triangle on the metal object, Turlough reveals he too has the mark on his arm. So where are we? Things not looking good for Kamelion. Some sort of backstory hinted at for Turlough. Peri in – check. Something interesting, storywise? Actually yes – the time of fire on Sarn will prove either that Timanov’s god listens to him, in which case the unbelievers will be cast to the flames, or that it doesn’t, in which case, it’s the priest who will be sacrificed. Either way, somebody’s going to get crispy. 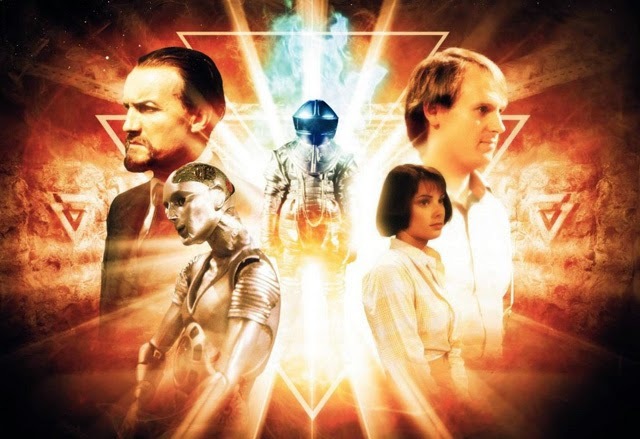 The Tardis follows Kamelion’s pre-programming, and takes the Doctor, Turlough and the unconscious Peri to Sarn, and when the wretched silver statue turns first into a facsimile of Howard, and then, as soon as the Doctor and Turlough leave the ship, into the Master, things get complicated. 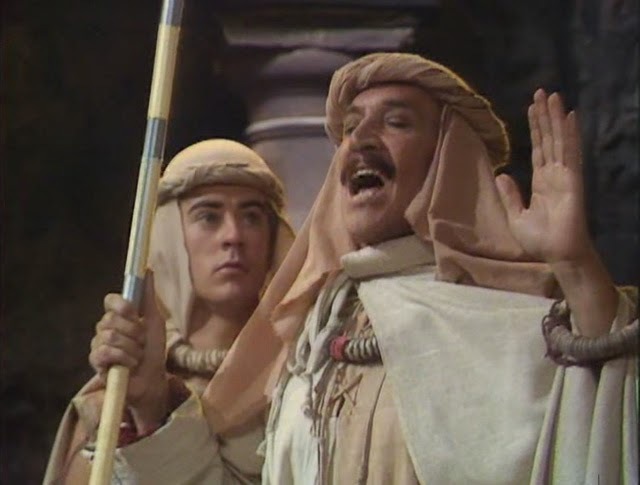 There’s a delicious point to the arrival of the Tardis on Sarn – something like it’s arrival, in very vague language, has been written into the prophecies of Logar, and Timanov is quick to use it to his advantage in the knife-edge debate, demanding that Malkon should decide to burn the unbelievers in this time of prophecy fulfilled. With the double-triangle design scrawled on bits of Sarn, Turlough reveals that the ‘Mesos Triangle’ means there are people from Trion there – Trion being his home planet. 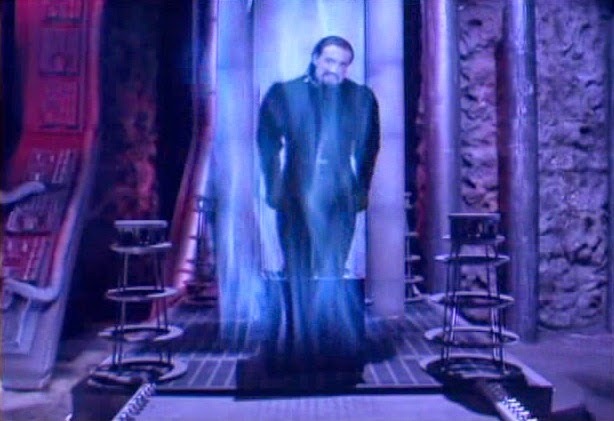 It emerges that the Master, having experimented with his Tissue Compression Eliminator and accidentally shrunk himself down to the size of a Borrower, has flown himself to Sarn with the intention of using the planet’s numismaton gas fires to regrow his body – the flames can have an amazing rejuvenating effect. He’s reconnected with Kamelion simply to have a big set of hands to do the heavy lifting his plan requires. When the Doctor gets involved with the religion vs science debate, he becomes firmly one of Sarn’s great debunkers – explaining the religion and the iconography of Logar point by point as the arrival of a crashed ship from Trion, the emergence of an astronaut in a fire-resistant spacesuit, and the leaving of Malkon, then a baby, on the Mountain of Fire – not a gift from the god, but the son of a political prisoner from Trion (and marked with the Mesos Triangle as such). Even when the facts are laid out in front of his eyes, Timanov refuses to accept them. His life’s meaning is so bound up in his faith that he will never accept the scientific, materialistic realities of life – a cogent moral from Grimwade: some people won’t believe the truth, no matter what you do. Turlough works out that Malkon is actually his brother – when he was sent to exile on Earth, the baby was in the ship that crashed on Sarn. And with the military on its way, Turlough makes the decision to face up to his family’s actions and reputation. When they arrive, it turns out the government on Trion has mellowed, and a general amnesty will allow him home without any further sanction. The boy who was consumed with anger and frustration to the point of striking a bargain with the Black Guardian has grown into a man ready to go home and help forge a better world than the one that sent him away. The Doctor has allowed the Master to enter the numismaton flow, and then simply added calorific gas to the flow, turning the nourishing flames into licks of intense heat, seeming to immolate his old school friend. And Kamelion, fearing he will never be free of the Master’s influence, has asked to be destroyed. The Doctor, though saddened by the request, kills him with the Tissue Compression Eliminator. Turlough backstory – check. Turlough out – check. Kamelion out – check. Peri in – check. Master – check. Location – check – both the Sarn shots and the footage of Peri drowning and being rescued were filmed in Lanzarote. Something interesting, storywise – definitely check. While not for a moment definitively saying that faith is bad, Grimwade painted a backdrop against which the science vs faith debate could be played out, where faith which denies evidence and rationality, and which is willing to sacrifice life to preserve the perceived integrity of its story, is shown to be a dangerous thing. Doctor Who has frequently had a moral that inspires those who watch it, or makes them proud, or makes them think, or does all three at once. On a planet where in the 21st century, people are beheading people, or shooting cartoonists, or denying the evidence of evolution and paleontology, or telling women they have no right to choose what happens to their bodies, or telling gay people they have a lesser kind of love, because a faith-story is more important than life, than free speech, than verifiable evidence or personal, sexual freedom, Whovians could do worse than to make sure Planet of Fire is shown - everywhere.